Motorola’s Droid 2 takes only baby steps forward from the original, struggling to keep up with new titans like the Droid X. When the second generation of a product is unveiled, you expect major upgrades from the first model. Motorola takes a different approach with the Droid 2, the follow-up to last year’s ground-breaking Droid, both from Verizon. Rather than a fanboy’s dream update, Droid 2 is barely a minor shift. If we were cynical, we’d say Droid 2 is Motorola’s greedy attempt to stabilize the price of the phone (the original is currently on sale at Best Buy for $49.99), now back up to $199.99. Considering the allure of the identically-priced but more feature-rich Droid X (despite reported problems with its implementation of Android 2.2), it’s even more surprising the Droid 2 isn’t more of a radical shift from the first Droid. Not that it’s a bad phone – but Motorola has missed an opportunity to take the slide-out keyboard Droid to the next level. Physically, the Droid 2 is nearly identical to the original; a chrome frame around the top of the phone is the easiest way to differentiate the two. Operationally, Motorola has re-arranged the four Android navigation buttons below the screen (Back, Menu, Home, Search become Menu, Home, Back, Search – oh, goody); the slide-out keyboard (which isn’t as spring-loaded smooth as, say the one on the Samsung Epic 4G from Sprint) now has individual directional buttons, rather than a square toggle that depresses at each edge; and, there are some meaningless differences in the way Android 2.2 is implemented (the original Droid can now be updated) – different icons, primarily. Big deal. Performance-wise, Droid 2 does step up to a 1GHz processor from the 550MHz chip in the original, so the Droid 2 is slightly faster. Also now standard is DLNA connectivity, a widescreen still-photo setting, and an included Blockbuster app. You even get the same amount of memory – 16GB, albeit arranged a bit differently: the Droid 2 has 8GB built in and a pre-installed 8GB microSD card, while the original had 256 MB built-in but an included 16GB card. Otherwise you still get the same black horizontal slider with a three-row QWERTY keyboard (no dedicated numeric row), a widescreen 3.7-inch 854 x 480 LCD, 5-megapixel camera with dual LED flash and 4x digital zoom, Wi-Fi, Bluetooth 2.1. 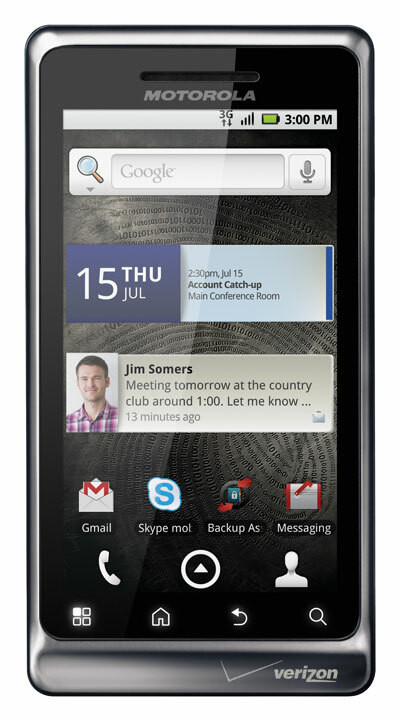 A bit more dismaying is how much more you get with the Droid X at the same price as the Droid 2: a 4.3-inch screen, an 8-megapixel camera, 24GB included total memory (8GB built-in and a pre-installed 16GB card), and HD video recording. The second Droid’s only advantages are its slide-out QWERTY keyboard and longer talk time. Besides the faster processor, the Droid 2 includes three other major upgrades from the Droid: 3G mobile hot spot capabilities for connecting up to five devices, more built-in memory, and a third more rated talk time (6.4 hours vs. 9.6 hours) despite same-size batteries. The Droid 2 has the same crisp, colorful display as the original, and includes a Blockbuster app, but not any of Verizon’s video offerings or MobiTV. 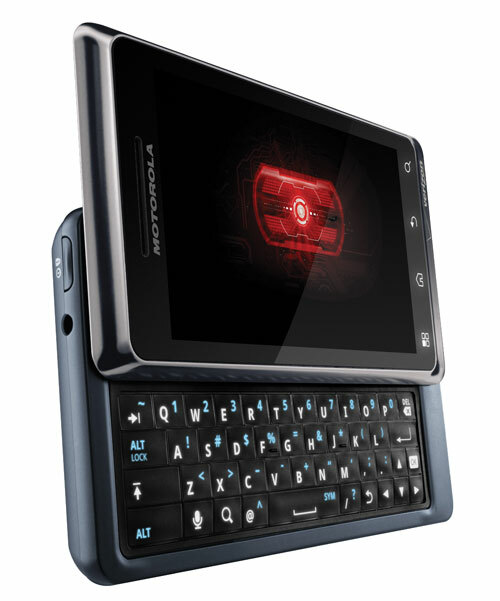 Its widescreen is perfectly proportioned for viewing side-loaded movies, but if you’re interested in the Droid as a PMP, you should be looking at the Droid X with its 4.3-inch screen. Either Motorola or the new Android 2.2 OS has solved the original Droid’s issue of not remembering what music track you left off from when switching to and from another multimedia app. Conversations are loud and clear from Droid 2, but listeners on the other end reported a bit of muddiness coming through. Sound may be muffled for speakerphone and multimedia listening since the long, thin speaker is mounted on the rear of the phone.